Over the last week a terrible thing happened. I started to notice a strange off color on the back and top handle of my bag, that only seemed to increase as I wore it. Slowly, it dawned on my that my denim was rubbing off on the bag! Shoot dang! But not to worry, we can solve this. 1) Dip your paper towel into the water. Just a dip, you don't need much. Pick a spot on the bottom of the bag and wipe a small area (2 inches or so) side to side. This is a test. If you notice any discoloration, stop immediately and call someone who cleans handbags professionally. 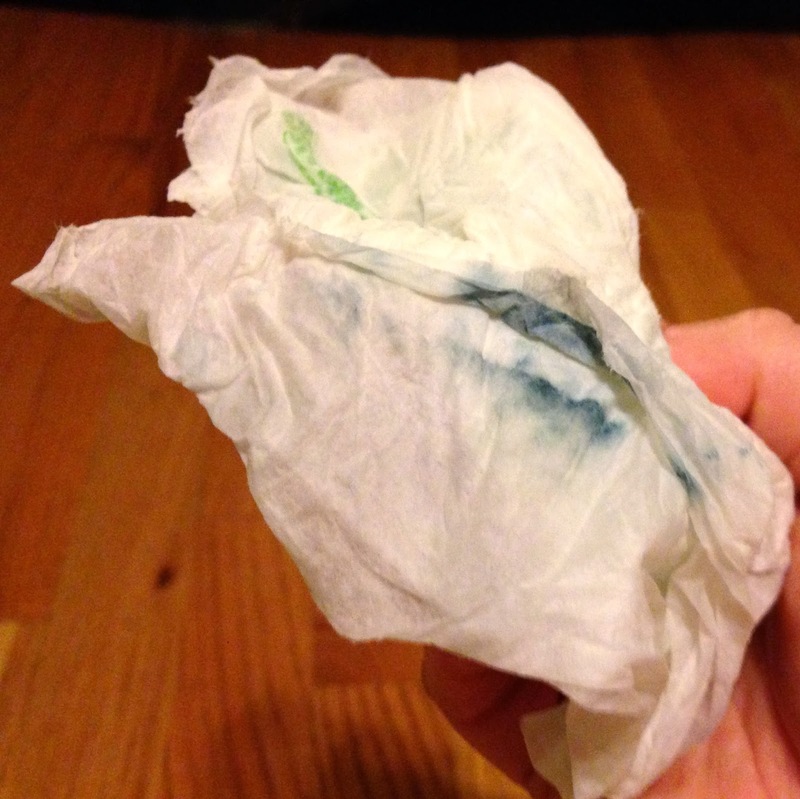 2) If there is no discoloration, use the damp paper towel to wipe slowly over the affected area. You should start to see the color come away from the bag and into your paper towel. 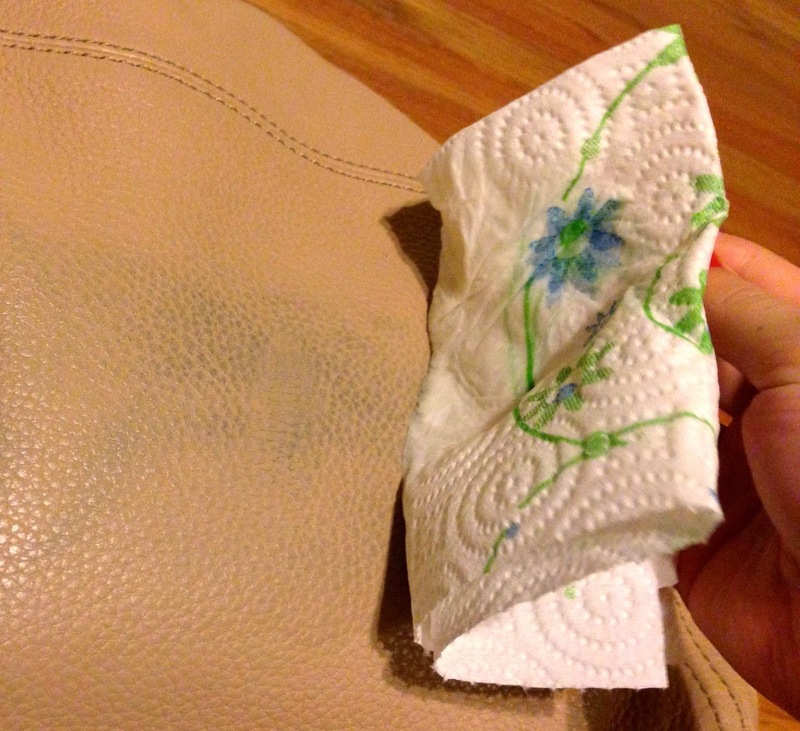 Change paper towels as needed to avoid rubbing the denim color back on to your bag. 3) If the stain is really stubborn, dampen a new paper towel and put a dab of baby shampoo on it - a drop about the size of your pinky nail. Rub the shampoo into the paper towel until it starts to lather, then softly test on the bottom of your bag to make sure there's no discoloration. If it's safe, use this to wipe away any remaining denim rub-off. When you're done, remove baby shampoo residue with lukewarm water and dry using a new paper towel. Easy peasy! If this helps you let me know. And if you have any tricks, please leave a comment below!